When it comes to wifi, signal fluctuation is incredibly common. The reason is that your wifi signal is constantly changing due to external conditions. Some days you’ll be able to browse without disconnecting, and others you’ll be in a battle just to stay online. This is made even more difficult if you don’t have the tools to diagnose the problem. This is where a wifi analyzer can be useful. In a nutshell, a wifi analyzer app breaks down information from access points on your network and places it into a single screen. 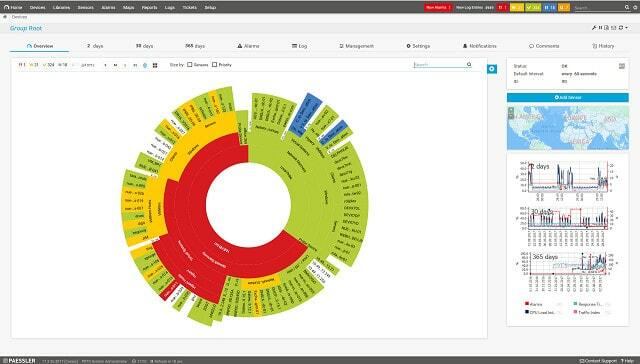 A wifi analyzer generates a visual display of the network data of your surrounding channels. The app turns your computer or mobile device into an analytics program that allows you to identify what you need to do to optimize your network. 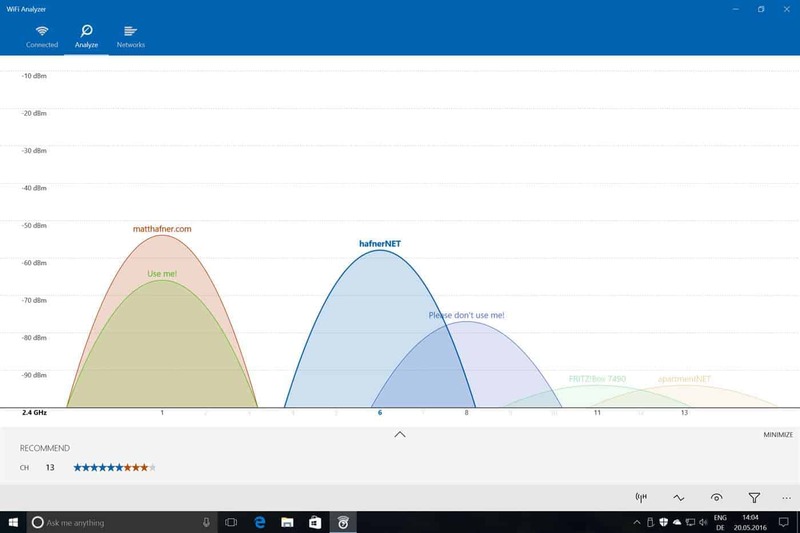 For example, with a wifi analyzer app like Microsoft Wifi Analyzer, you can look at other channels on your network and identify if they are faster than your current channel. Some providers will even allow you to draw up heat maps of signal distribution in your house or office to help you find the best location for your router. SolarWinds WiFi Analysis with NPM (FREE TRIAL) – Part of the Network Performance Monitor that runs on Windows Server, this tool shows a live list of wifi endpoint statuses and generates an amazing wireless signal heat map. The PRTG system covers wireless networks and includes alerts and capacity reports for wifi. Paessler PRTG (FREE TRIAL) – The PRTG system covers wireless networks and includes alerts and capacity reports for wifi. NetSpot – Built for Windows and Mac OS, this wireless monitoring system includes autodiscovery and live performance maps. Acrylic Wi-Fi – A wifi analyzer for Windows that is free for home use, but business customers have to pay. InSSIDer – A competitively priced easy-to-use wireless traffic analyzer. WiFi Analyzer – A Microsoft product to analyze wireless networks that is available in both free and paid versions. Vistumber – A nifty free wifi analyzer that can overlay signal footprints on a Google map. Wireshark – A very well-known wireless packet sniffer that aids hackers and system administrators alike. 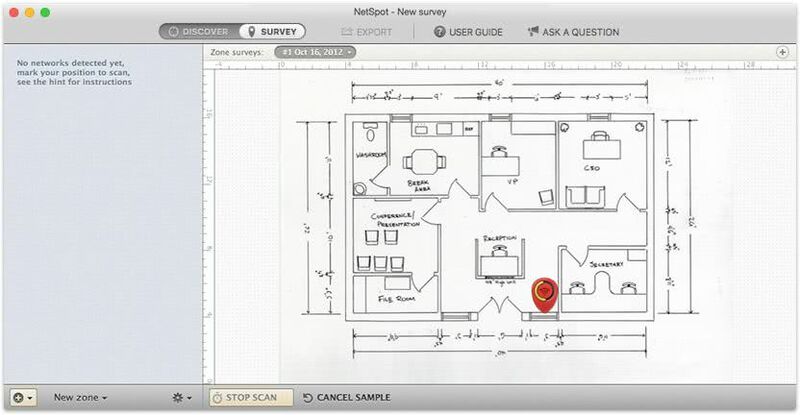 Netspot – A wifi analyzer for Mac OS that includes a heat map facility and an interference assessor. WiFi Explorer – A mid-level wifi analyzer for Macs that includes signal strength indicators and noise measurements. WiFi Scanner – A wifi scanner for Mac OS that is suitable for both business and home users. iSumbler for Mac – A wifi analyzer for Mac OS that also tracks Bluetooth and Bonjour signals. 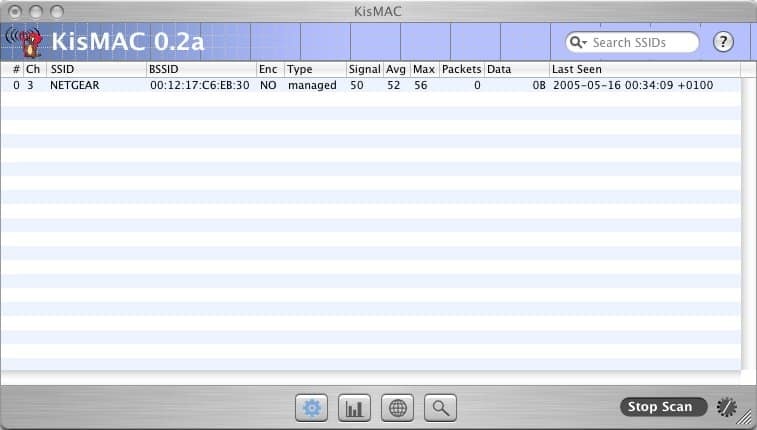 KisMAC2 – A wifi analyzer for Mac OS that includes metrics for Apple Airport Extreme. Kismet – A free wifi analyzer for Linux, Unix, and Mac OS that can be extended by plugins. wavemon – A free wifi analyzer for Linux that is available from GitHub. Sparrow-WiFi Analyzer – A wifi analyzer for Linux that tracks Bluetooth as well and can also employ GPS. WiFi Analyzer – A widely-used wifi analyzing app for Android. 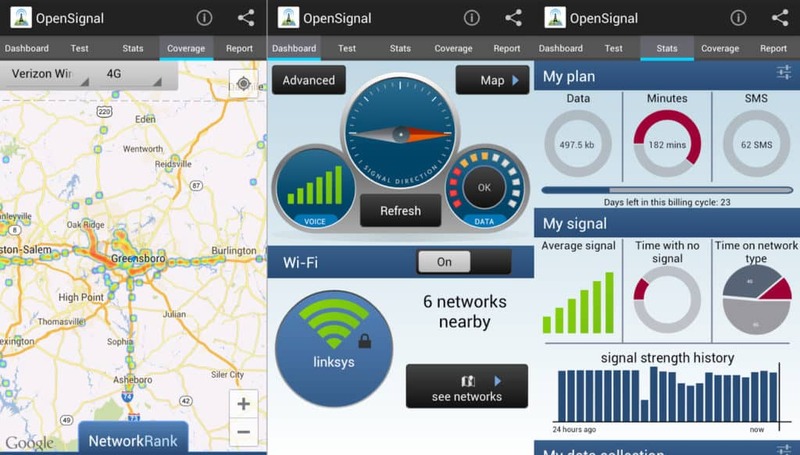 OpenSignal – A wifi and phone signal analyzer for Android that includes geographical maps with signals imposed. WiFi Monitor – A wifi analyzer for Android produced by Microsoft. Network Analyzer – A wifi monitor for iOS in both free and paid versions. 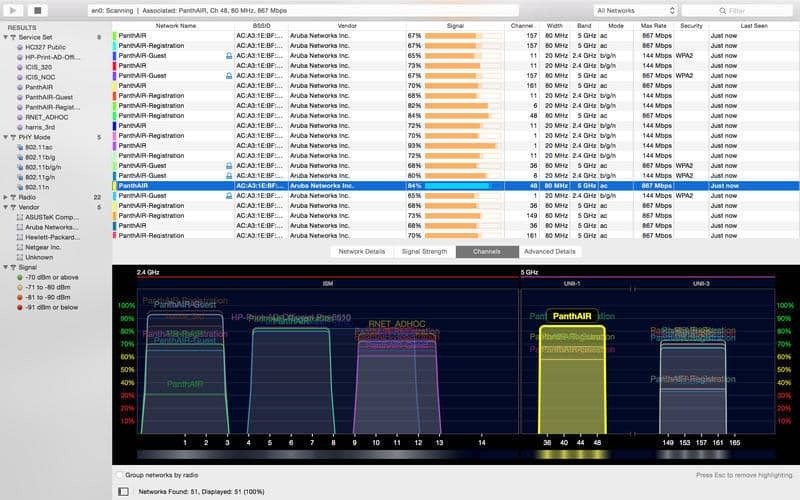 MasterAPP Wifi Analyzer – A wifi detector for iOS that includes performance analytics. 1 What’s a Wifi Analyzer? The main reason why you need a wifi analyzer is to maintain your connection quality. Wifi signals are in a constant state of fluctuation. Your wifi connection can be performing well until something in the network changes and starts to impede its performance. Troubleshooting a problem requires data collection and analysis. Without the source information on the normal operations of your network and the current behavior of the troubled system, your solution will be mere guesswork. When your wifi starts to slow down or disconnect, a wifi analyzer will help you to identify the problem. By diagnosing the problem and addressing it, you ensure your connection stays up and running with minimal interference. A wifi analyzer enables you to run diagnostics on what is happening with your connection and provides you with the information needed to optimize your network. For example. if your signal distribution around the house is poor, you’ll be able to use an analyzer to find this information out. That being said, wifi analyzers can be used for much more than troubleshooting your signal distribution. 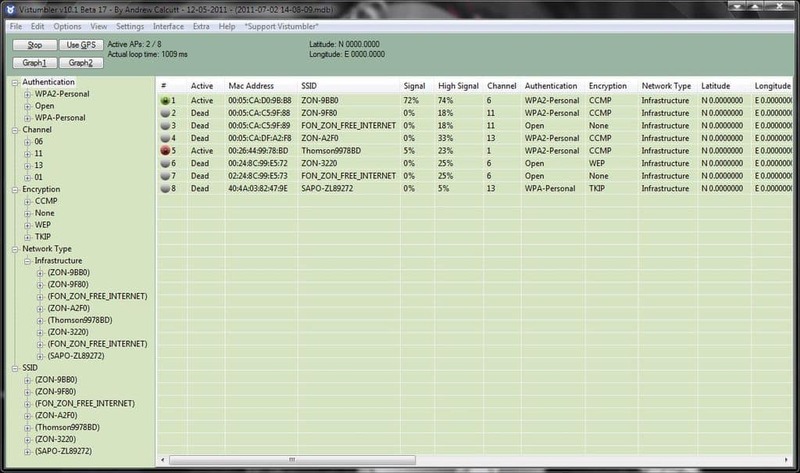 You can use a wifi analyzer to locate and use a less congested channel. Sharing the same channel with nearby devices results in low connection speeds, interference, and disconnection. It’s not uncommon for channels to be shared amongst your neighbors (particularly if you live in an apartment). This is one of the most common reasons for poor connectivity and can be rectified via the use of a quality wifi analyzer. 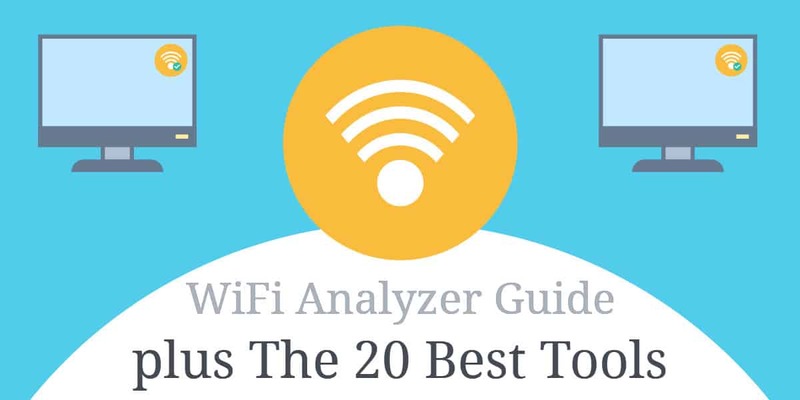 Using a wifi analyzer can help improve your user experience, speed up browsing, and eliminate the hassle of trying to guess what factors are impeding your connection quality while troubleshooting. After all, it’s almost impossible to optimize your network if you lack the tools to be able to be able to see what’s going on. Many advanced wifi analyzers will have an inbuilt heatmap function. As mentioned above a wifi heatmap will produce a visual display of the signal strength in your house. You’ll be able to see where your signal is strongest and choose the best location for your router. One of the best heatmap tools on the market is SolarWinds Wi-Fi Heat Map. Solar Winds allows the user to create custom wireless heat maps and displays ‘dead zones’ where connectivity is poor. The tool works by reading the signal strength of nearby access points and indicating the quality of your connection based on signal location. What makes this tool so effective is that the wifi heat map can produce a physical image of an entire network site. This allows you to easily identify where your site is causing problems for your connection, and what needs to be done to address it. In short, a heat map makes it easier to improve your coverage and signal strength. The SolarWind’s Wifi Analyzer module that comes with the Network Performance Monitor (NPM) will keep your wireless networks ticking over faultlessly. This tool begins its service life with an autodiscovery phase. The AP detection system then continues running in order to give you live statuses on your wireless networks. The inventory built up by the discovery phase automatically translates into a map of your wireless devices. You can even generate a wireless heat map by uploading a floorplan of your premises. This will show the signal footprint of all of your wireless APS and helps you see instantly where overlaps and gaps cause service problems. The NPM tracks the statuses of all network equipment, not just wireless APs, so you will be able to see how your WiFi system fits into your wider network, including remote sites and Cloud services across the internet. The support given by the WiFi Analyzer highlights Wi-Fi bandwidth issues and performance impairment so that you can quickly resolve problems and improve service. The screens of the monitor contain live status reports and also include an investigative tool, called PerfStack, which uses drag and drop access to let you lay performance charts on top of each other. This gives you a clear picture of what equipment is the root cause of any performance problems, which you will see ripple through the stack of charts. An alternative performance monitor view in the tool is the NetPath screen. This shows you the transition points between all of the links in your network, letting you see the route that signals cross from and to your wireless networks. This is another opportunity to get a visual clue on where performance problems lie. You can get the SolarWinds WiFi Analyzer module as part of the NPM. It installs on Windows Server and you can access the software on a 30-day free trial. SolarWinds WiFi Analysis with NPM: this tool takes our top spot thanks to its wide range of features that beginner and advanced users alike will appreciate. Paessler PRTG will discover all of the network devices on your network including wifi routers. The discovery phase of the network monitor’s operations creates a network map. This shows which other devices on the network are connected to your routers. PRTG uses three methods to monitor wifi routers. SNMP, which is the Simple Network Management Protocol, informs the central collector of a monitored router’s statuses. This information includes the throughput capacity and health of the router. The NetFlow messaging protocol is the second monitoring medium used by PRTG. This standard broadcasts network traffic metrics, which are picked up by the PRTG collector. The third monitoring system for wifi routers is the PRTG packet sniffer. This examines the headers of packets crossing your network. The tool only captures the headers of those packets, so your data privacy is preserved. The packet sniffer reports on traffic volumes by application, port number, and protocol. The interface of PRTG interprets all of the data collected on your wifi networks, creating graphs of real-time data and also charts of historical data. Any problems arising in the router that could cause an interruption of service get reported to the monitor as soon as they arise. These alerts highlight overloading or equipment failure. You can set warning points so that the system will notify you if traffic approaches critical conditions. You can even create custom alerts that combine several different conditions. Paessler PRTG installs on Windows or you can also opt to get the system as a cloud service. Paessler charges for PRTG according to the number of sensors that you activate. PRTG is free if you only want to monitor up to 100 sensors. PRTG comes with a 30-day free trial. As mentioned above, NetSpot is one of the best programs on Windows and Mac because of its detailed heatmap. The user can upload a map of their location and run a survey with little complication. Once the survey has completed, the areas where your connection is strongest will be marked in red. In NetSpot’s discover mode, you’ll be able to compile data from the surrounding wifi networks and convert it into a table. 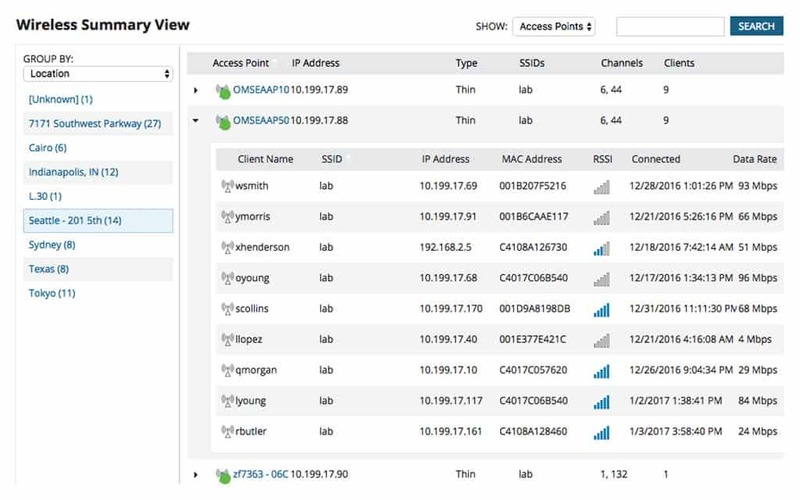 On the table, you’ll be able to access information on the SSID, MAC Address, Signal Information and Vendor. Likewise, you can convert this data into a CSV file in order to create a paper record. The program’s combination of simplicity and technical detail make it suitable for both home users and network administrators. 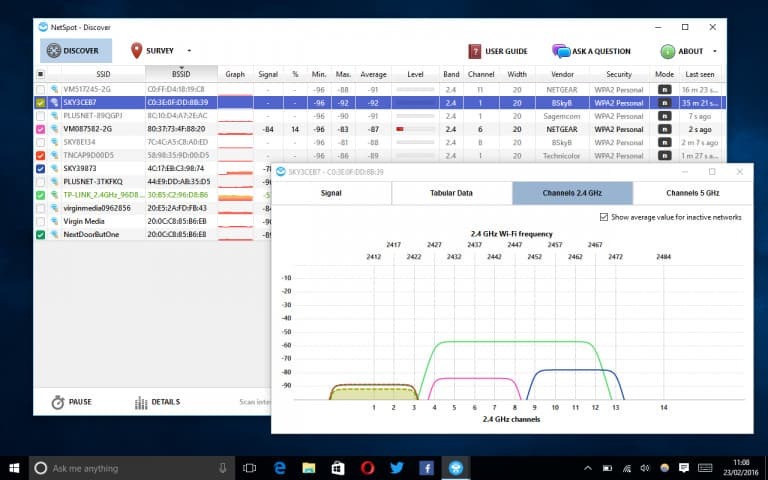 Acrylic Wi-Fi is a free wifi analyzer designed for Windows. The user can scan for local wireless access points and compile a table of the relevant details. All the core metrics are included in the table, such as MAC address, SSID, RSSI, channel and vendor. In addition, the monitor mode allows the user to monitor network packets, which can be used to locate hidden networks. Unfortunately, Acrylic is only free for personal use, and business users will have to obtain the professional version. The professional version can be obtained for a one-off fee of $47.99 (£34.52), which grants the user access to more detailed network information and report generation. 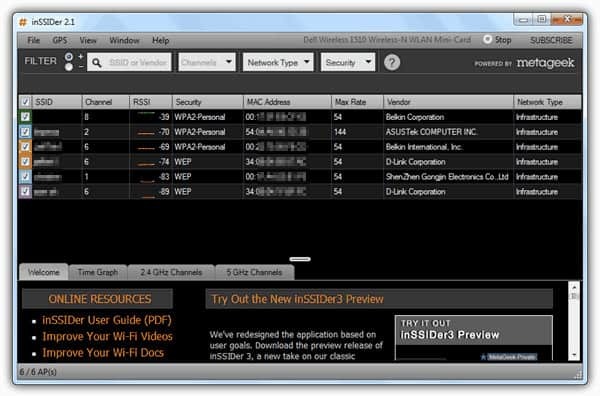 At $19.99 (£14.38), inSSIDer is one of the most competitively priced wifi analyzers on the market. The app breaks down all the relevant data about your nearby wireless networks whilst detailing a variety of information on your access points. Users are able to view information on everything from encryption type to signal strength and channel. What makes inSSIDER stand out is its ease of use. In order to find more information about a network, you simply right click on it and you will be shown a menu of data to single out. You can click on SSID, signal, channel or network type to see more information on that category. The simplicity of the user interface makes it ideal for less experienced users but network professionals will find the functions to be limited. For example, most versions of insider don’t offer GHz channel utilization or 5 GHz spectrum analysis. 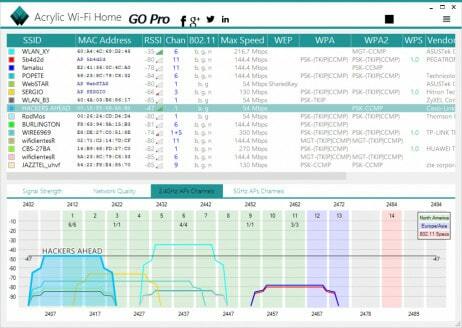 WiFi Analyzer is Microsoft’s answer to poor connectivity. Users looking for an easy-to-use wifi analyzer should look no further. The app has been designed specifically for home users and transforms the user’s network into a visual display where they can clearly see their signal strength. Like many other apps on this list, Wifi Analyzer is available in both a free and a pro version for $2.99 (£2.15). The free version provides you with all you need to produce graphical displays and identify problems within your network. The pro version builds on this by providing an auditory beeper for signal strength and the ability to change signal strength borders. As a bonus, the user can also connect straight to a new network via the app. The simplicity of the user interface and the visual display make this an ideal choice for those new to wifi analyzer tools. WiFi Analyzer makes it easy to look up available channels on your network and transition to the one that’s optimum. If you’re looking to run wifi analytics on a budget, Vistumbler should be your first port of call. This free tool allows the user to locate nearby access points and collect data on their signal strength. When using the platform you can create a unique graph of every network in your vicinity. Vistumber’s graphs make it easy to identify which networks are performing well, and what you can do to improve your own network performance. If you’re looking for more of a location-based approach, then you’ll need to add a GPS to your laptop. If you do this you’ll be able to generate a wireless network map over a Google earth image. This means if Vistumbler finds a network it pinpoints it on the map with its accompanying information (name, encryption type, signal strength). The only problem with Vistumber is that it’s not easy to use. Vistumbler was originally designed to enable users to search for wifi networks in moving vehicles, so it’s not tailored toward home or office users. However, once you get past the initial learning curve, it offers more than enough to optimize your network. Finally, we have Wireshark. While technically packet analyzer and robust open source network analysis tool, Wireshark can also be used as a wifi analyzer tool for Windows, Mac, and Linux. This free program is tailored towards both professional and home users. Wireshark is a powerful network analyzer and has the strength to generate data on an entire office network. The only problem with Wireshark is there’s not much in the way of external support. There’s an active community but little to no supporting documentation to help users with any problems that arise. That being said, the diverse functionality of the platform offers more than enough to provide home and office users with an industry standard wifi analyzer suite. 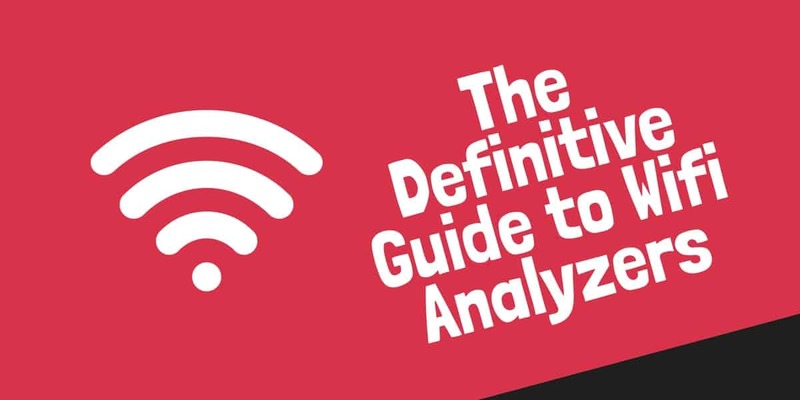 When it comes to wifi analyzer apps for Mac, Netspot is one of the best offerings on the market. Netspot offers a detailed heat map that allows the user to identify signal strength in their surrounding location. The app collects data on everything from channel width, to MAC address, signal quality, and network encryption to provide more transparency over your local network. 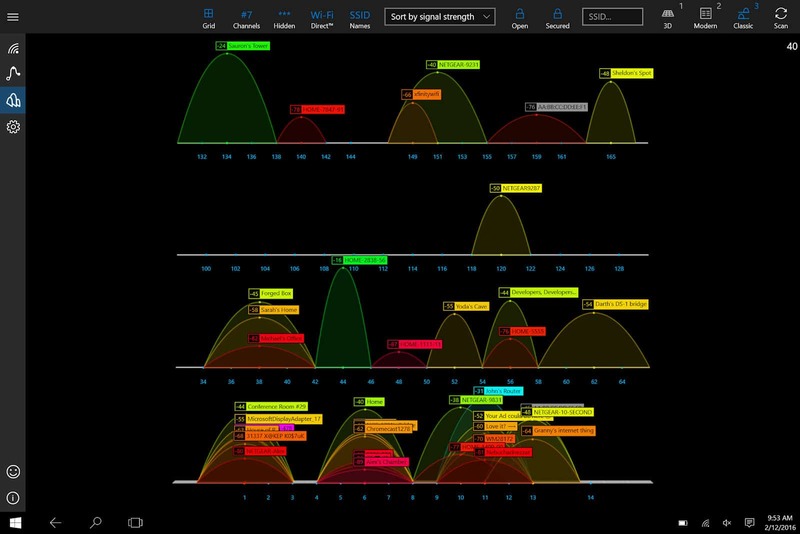 Unlike many other analyzers, NetSpot allows you to assess WLAN interference as well. What really sets this app apart from the crowd is the depth of its reports, ease of use and network information. The program color codes areas of signal strength, with weak signals being highlighted by purple or blue. The scalability of the heat map renders NetSpot ideal for both home and office users. The home version is available for $49 (£35.26) and the professional version for $149 (£107.21). However, the app provides another version where users can scan for local networks and view signal strength for free. As one of the best mid-level tools on this list, WiFi Explorer is a solid alternative for beginners and experienced users alike. When a user launches WiFi Explorer they can start to locate local wireless networks immediately. Once this occurs, the user can flick through the networks identified via the use of the on-screen tabs. Users can look through everything: network details, signal strength, 2.4 GHz and 5 GHz channels. The signal strength tab is WiFi Explorer’s version of the heatmaps seen in other apps like Solarwinds. You can simply set the app to measure signal strength and it will produce a graph as you walk around your building. The only drawback is that you won’t be able to detect hidden networks. This is because Apple doesn’t provide the necessary data in order to detect hidden wireless networks. It’s worth mentioning that the app also provides a range of information to assist more experienced users looking for advanced functionality. You can identify information such as the SSID, BSSID, signal-to-noise ratio and signal quality after you’ve identified another network. Whether you’re looking to break down your network performance or locate a more efficient channel, WiFi Explorer has you covered. AccessAgility’s WiFi Scanner is one of the best-kept secrets when it comes to wifi analyzers. This competitively priced tool retails at $14.99 (£10.79) allows users to analyze their networks download and upload speeds with simplicity. This makes it ideal for home users who don’t have a large budget. The app breaks down access points in the surrounding area and provides information such as BSSID and MAC addresses. Unlike many other tools on this list, WiFi Scanner also enables the user to detect unauthorized devices on the network through the use of an IP scanner. This makes it a great tool for overall network transparency. Rather than opting for a visual display, iStumbler scans for wifi networks and puts them into a list. This list is updated in real time so you can click on any networks you see and view more detailed information like dBm values. You’ll be able to see how much signal there is available, as well as any noise on a given channel. It’s worth mentioning that you can also break down Bluetooth, Bonjour and locations connections beyond your wifi signal. Unfortunately, the free version bombards the user with endless popups encouraging them to upgrade. However, this can be avoided if you choose to upgrade to the $20 (£14.39) version. The depth of the signal data and the ease of use of the platform makes this a good choice for users who are new to the world of wifi analyzers. KisMAC 2 is a formidable and technical open source wifi analyzer that supports a wide array of wifi analytics functions. Like other programs, all you need to do to start scanning your network is press start. You’ll then be able to break down your network signal strength, though KisMAC’s capabilities go far beyond that. You can also analyze USB Wifi adapters, Kismets servers, and drones. In terms of more advanced features, KisMAC2 helps the user break down SSIDs whether they’re open, hidden or closed. Likewise, the platform supports Apple Airport Extreme, which helps to extend your network transparency even further. The only limitation is that KisMAC is aimed at professional users and it can be very difficult for newer users to navigate. 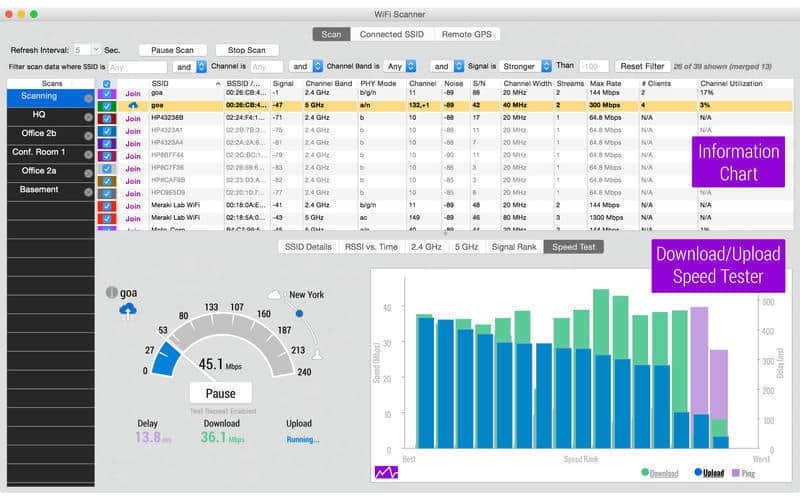 Kismet is wifi analyzer or network analyzer designed to work with IEEEE802.11 Wifi cards. Kismet is often used by Linux users but can also be used on FreeBSD, NetBSD, OpenBSD and Mac OS as well. This tool is widely used because it offers support for a range of protocols including Bluetooth and RTL433. The Kismet 2018 version is offering a number of features that enhance the basic functionality of the platform. Now when working with a large team you can conduct real-time live streaming of captures to share information with other colleagues on network activity. If you wish to customize your experience then you can make use of external tool APIs to add additional features. Kismet has a number of plugins available to expand on the basic product including Kestrel, IoD – Screwdriver and Elkentaro’s Simplified Mobile Dashboard and ElKentaro’s Simplified Mobile Dashboard. Kismet can be downloaded for free. 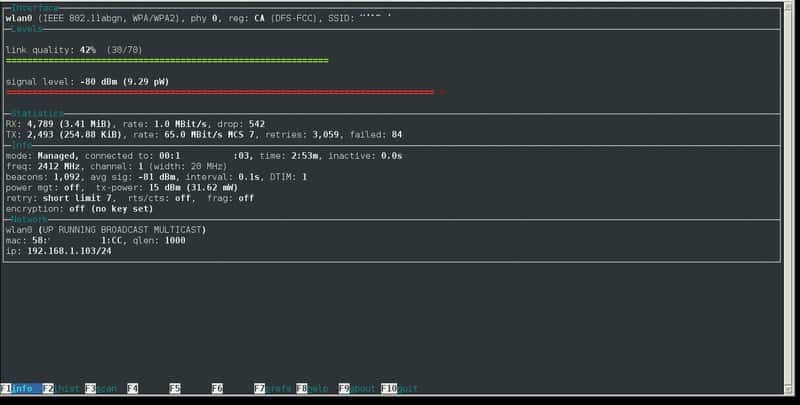 wavemon is a free open source wifi analyzing tool that allows users to monitor devices on Linux. In order to use wavemon, you’ll need to enable wireless extensions. When using a kernel setup with CONFIG_CFG80211 you need to make sure that CONFIG_CFG80211_WEXT package is activated. You will also want to make sure that you have the pkg-config package. Once you’ve done this the user experience is quite straightforward. wavemon uses autoconf so that you can make your way through the setup process promptly. The program is kept updated on Github so that you can add updates regularly. wavemon is available as source code from GitHub via this link here. 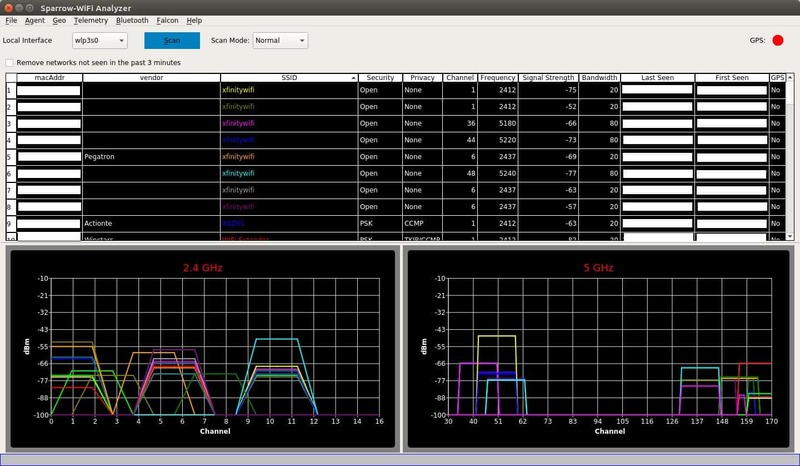 Sparrow-WiFi Analyzer is a 2.4 GHz and 5 GHz Wifi and Bluetooth analyzer for Linux. The sparrow-wifi platform has been positioned as a more GUI-friendly replacement for other tools like inSSIDer and linssid. When using this wifi analyzer you can conduct wifi SSID identification and track wifi sources. There is also the ability to use GPS to track SSID’s and Bluetooth devices. sparrow-wifi enables you to create Google maps that log these for you. If you need to further analyze your wifi results then you can also import and export data to CSV and JSON. If you’d like to download sparrow-wifi then you can do so from this link here. When it comes to wifi analyzers for Android devices, Wifi Analyzer is a name that keeps cropping up. With over 10,000,000 installs, this app is one of the most established wifi analyzers on the platform. Wifi Analyzer is adept at identifying nearby networks. The app will scan and create a visual representation of your wifi signal. This visual image is great for providing an overview of your local channels. 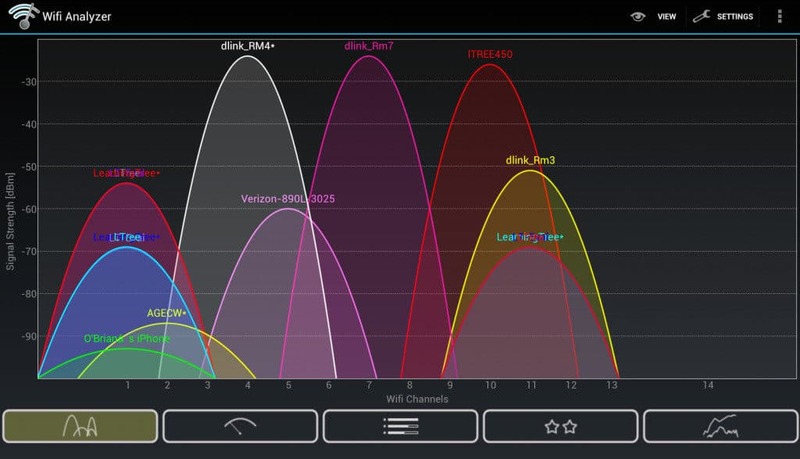 As soon as you load up Wifi Analyzer you’re shown an image of nearby signals that allow you to identify oversaturated channels. This makes it much easier to spot a less congested channel and move accordingly. This effective app is available for free although you will have to tolerate some on-screen advertisements. OpenSignal is one of the most versatile apps on this list. You can see your wifi signal coverage on a virtual display and run speed and latency tests. What really sets OpenSignal apart is its detailed maps system. You can view a map of wifi hotspots and phone towers in order to see where connection quality is best. It’s worth noting that the phone towers shown, only pertain to your telephone provider. OpenSignal is the best choice for users looking to monitor both their wifi and mobile signal coverage. Of course, you can still generate extensive wireless network information if you are looking to stick to the fundamentals. This app is also competitive in terms of price, being available for free with no onboard advertisements. Microsoft’s WiFi Monitor has made a name for itself on Android for good reason. The app combines substance with a simple user interface. 4 tabs (Connection, Networks, Channels, Strength) allow the user to delve deep into their network parameters. The Networks tab breaks down all nearby wifi networks and the Channels tab shows how your wifi channels are distributed. You can then use the strength chart to assess your signal strength and to identify where you have a weak signal. Under the speed chart, you’re provided with a detailed breakdown of all the data you’ve transmitted and received. If you’re looking for a free app that has core functions with depth, WiFi monitor should be your first choice. You have already been introduced to this analyzer from Techet. The company produces a free ad-supported version for iOS, which is called Network Analyzer Lite. If you don’t want to put up with the advertisements, you should opt for the paid Network Analyzer Pro. The Network Analyzer operates within the limitations of iOS and it can give you a list of wifi devices within range and the results of a series of network performance tests. You would recognize the name of this IOS app from the Windows section of this guide. However, this is not the same product and it is produced by a different company. The MasterAPP Solutions Wifi Analyzer isn’t able to capture packets because of the operating system restrictions. However, it can perform a series of network tests to derive details on network performance. dBm – dBm stands for decibel-milliwatts. dBm is the measurement used to measure the strength of a wifi signal. IP Address – A unique number punctuated with full stops used to identify a computer communicating via a wifi network. MAC Address (Media Access Control Address) – A unique identifier used to refer to a network adapter over a network. RSSI (Received Signal Strength Indicator) – A measurement used to identify the strength of a radio signal. Signal to Noise Ratio – The ratio of an electrical signal’s strength compared to outside interference. SSID (Service Set Identifier) – The technical name for a wifi network name. Vendor – A wireless network provider. Wifi Channels – A wifi channel is where wifi networks exchange data (Channels 6 and 11 are where most routers exchange data). Wireless Access Point (WAP) – A hardware device or configured node on a local area network that allows wireless devices to connect through wifi and Bluetooth connections. WLAN (Wireless Local Area Network) – A network that allows devices to connect, interact and communicate with each other wirelessly. Whether you’re a home user or a battle-tested network administrator, a wifi analyzer is a vital tool for managing your network. If you want to maintain the speed and integrity of your wifi connection, then a wifi analyzer app should be a high priority. There are plenty of different options available on the market. If you want to have full coverage it’s a good idea to look for a model with an inbuilt heat map, as this is the most effective way to see a real-time depiction of your local signal strength. Ultimately you’re looking for an app that’s easy to use and offers the functionality needed to achieve your needs. A home user might be able to scrape by on a free program, but an entire department will need a more powerful solution. Taking some time to research the right tool for your business will allow you to optimize your online experience much more effectively. Whether you’re a home or enterprise user, doing your research is the key to finding the wifi analyzer app that’s right for you.